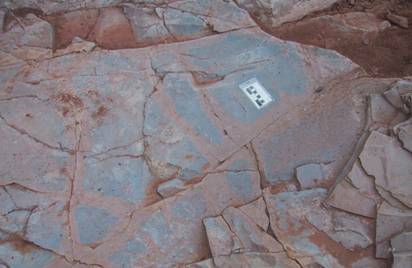 All petroleum reservoirs contain natural or man-made fractures. Natural fractures result from the interaction of earth stresses while man-made fractures result from drilling activities, increase in pore pressure in injection operations, reservoir cooling during water flooding, redistribution of earth stresses in the field as a result of injection and production practices, etc. Maximizing economic recovery from naturally fractured reservoirs is a complex process. It requires a thorough understanding of matrix flow characteristics, fracture network connectivity and fracture-matrix interaction. Characterization of fracture networks is a pragmatic process that relies heavily on experience and empiricism and very little (to date) on systematic approaches. Reservoir description should rely on information from many sources including static data (well logs, cores, petrophysics, geology, and seismic), and ultimately on dynamic data (formation evaluation well tests, long-term pressure transient tests, tracer tests and longer term reservoir performance). For fractured reservoirs, obtaining the right data and forecasting the reservoir performance is much more difficult than for conventional reservoirs. This statement is very well supported by a reservoir modeling study reported by Phelps and Strauss (2002). Furthermore, just finding fractures or mapping fractures is not good enough for developing a fractured reservoir. Indeed, these data, in addition to the conventional reservoir data, should be used to design production schemes that utilize fractures as an aid (Rothkopf and Wadleigh, 1994) rather than a detriment to production. But, to design a viable plan of development, one needs a credible reservoir description that includes mapping fractures in terms of aperture size, length, height, connectivity, conductivity, and frequency distribution. Reservoir description should rely on information from many sources including drilling data, routine and special core analyses, geologic, seismic and petrophysical information, and ultimately formation evaluation well tests, such as RFT, MDT, DST, and extended pressure transient tests. In the later stages of reservoir life, production data, such as well flow rates, WOR, GOR, and particularly tracer response in production wells, provide the type of data that can be used to refine the ultimate impact of reservoir description on reservoir performance. In addition to matrix petrophysical properties, the properties of fractures such as spatial distribution, aperture, length, height, conductivity, and connectivity significantly affect the flow of reservoir fluids from matrix to fractures and to the well bore. Fracture flow could be used to one�s advantage as in gas-induced gravity drainage of oil, where gas-oil contact in fractures is pulled down to expose matrix blocks to gas and induce oil gravity drainage. On the other hand, fractures could become channeling paths for flow of water or free gas, causing detrimental early water or gas breakthrough in production wells. Structural data, seismic time surfaces, seismic amplitudes, images logs, and field production performance can be used to estimate the fracture network properties (e.g., Gauthier et al., 2002). The approach is to build both deterministic and stochastic models with these data and validate them by comparing to the field performance (e.g., water and gas breakthrough). The first approach is a dual-porosity (DP) idealization of the reservoir, where a typical representative elementary volume (REV) of reservoir rock is assumed to contain a large number of equal size matrix blocks separated by interconnected fracture planes. The second approach is a dual-porosity/dual-permeability (DP/DK) idealization of the reservoir, where, contrary to the dual-porosity case, the matrix blocks also communicate with each other; therefore, there is matrix-to-matrix flow in addition to matrix-to-fracture flow. 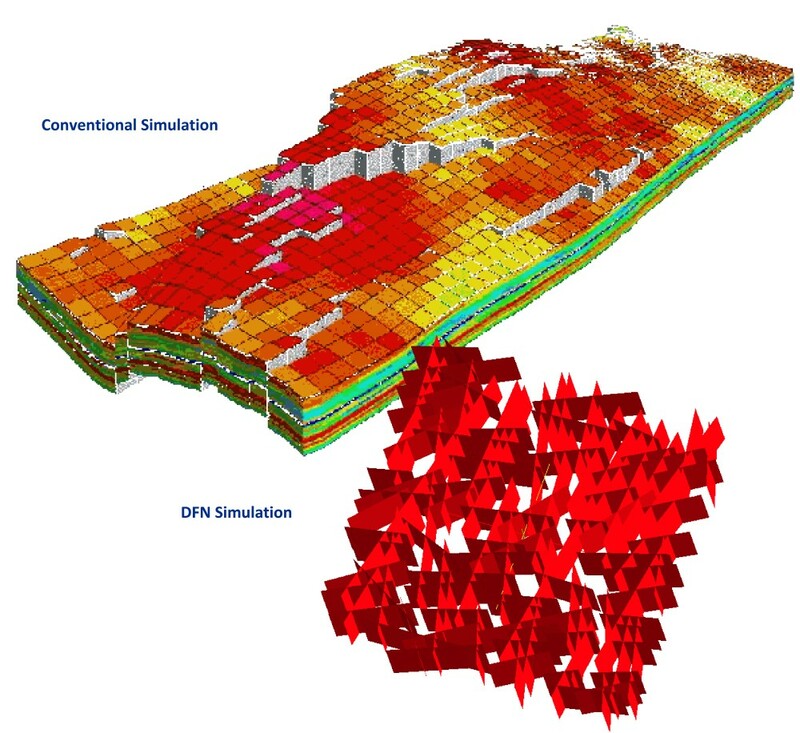 The third approach, the discrete fracture network (DFN) flow modeling, is the most recent method, which relies on three-dimensional spatial mapping of fracture planes to construct an interconnected network of fracture surfaces. Any three-dimensional reservoir rock volume, bounded by fracture planes, is, therefore, a matrix block.